Date Night is tired and hungry, and we need a place that’s fun, quick, and easy. 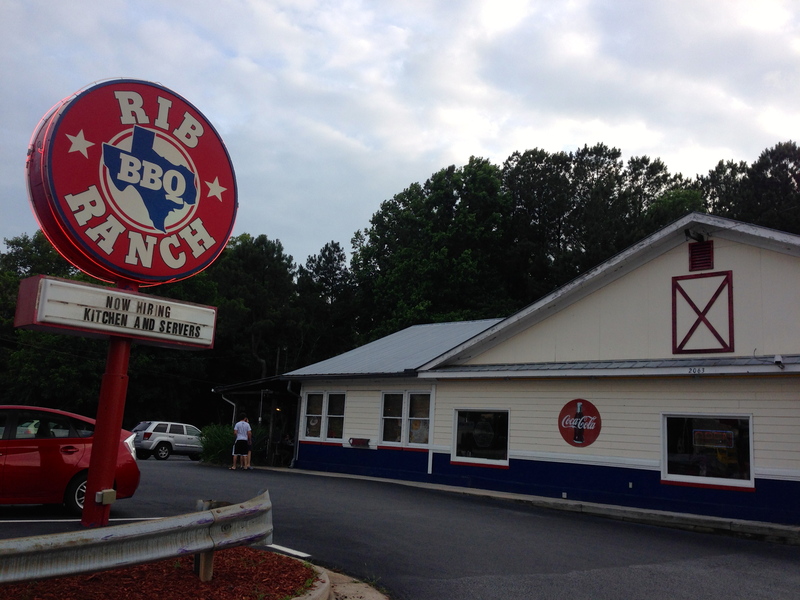 We head out Canton Highway to the Rib Ranch BBQ. Finding the front door is an adventure. We’ll let you do that on your own to see if you have as much trouble as we did. And the funny thing is, we have been here once before. They have a good Texas theme going, with lots of fun things hanging on the wall. For those of you who like to look up, the ceiling is a work of art. Everything is done big. There are no fried pickle chips on this menu. Instead, you get the whole pickle spear. 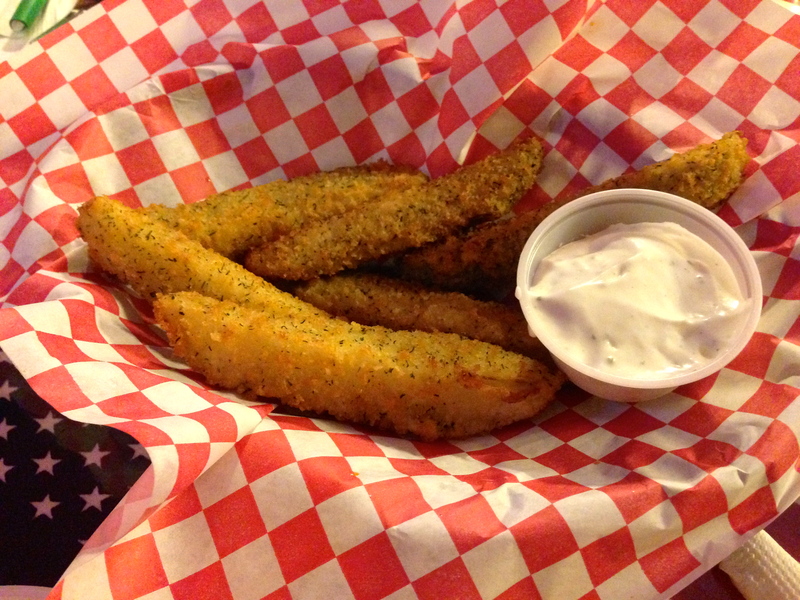 Dip it in the ranch dressing and you get an excellent appetizer. 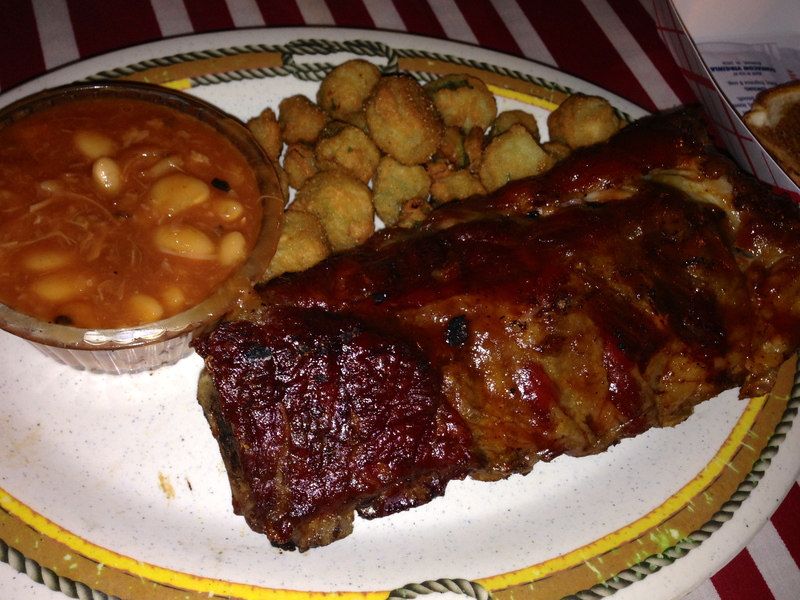 Many BBQ experts judge a BBQ place by its pulled pork and Brunswick stew. Date Night does things a bit differently. We judge by the ribs and macaroni and cheese. Is there a lot of love in them? Indeed, there is. 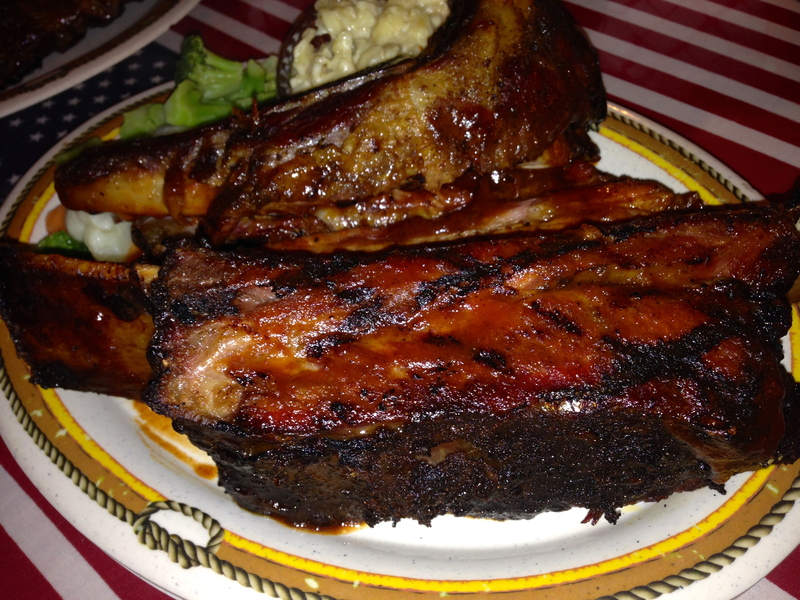 We order the beef rib and throw in 3 pork ribs on the side. Everything is huge. The “brontosaurus” rib is bigger than my forearm. Our server Michelle, who is one of the nicest servers Date Night has had in a long time, tells us that there is over a pound of meat on the beef rib. We cannot dispute that. Here it is from another angle, just so you can see how big it is. 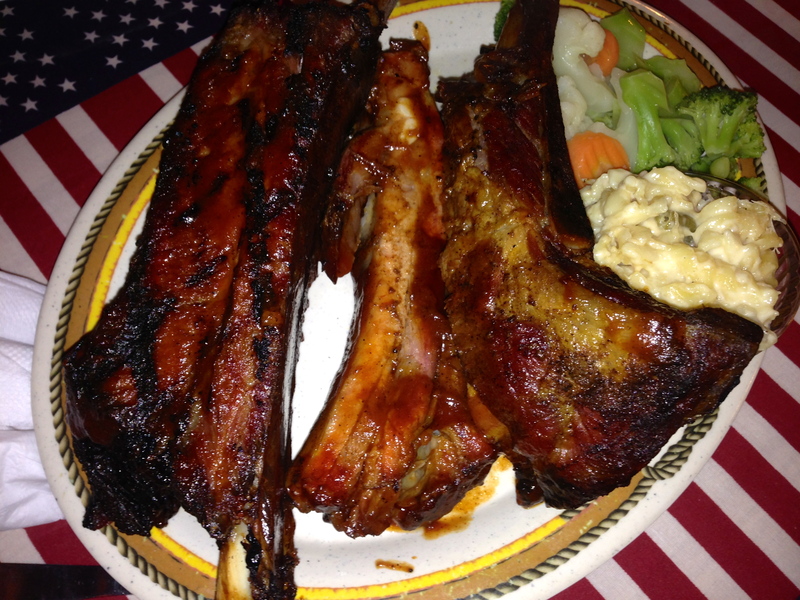 And check out the size of those pork ribs. They are big and meaty too. By the way, the macaroni and cheese is excellent. There’s a lot of different cheeses in there and it’s obvious that they made it from scratch. No Kraft box mixes here. The veggie side is a bit disappointing. It tastes like frozen vegetables, but you probably shouldn’t order something green in a BBQ joint in the first place. 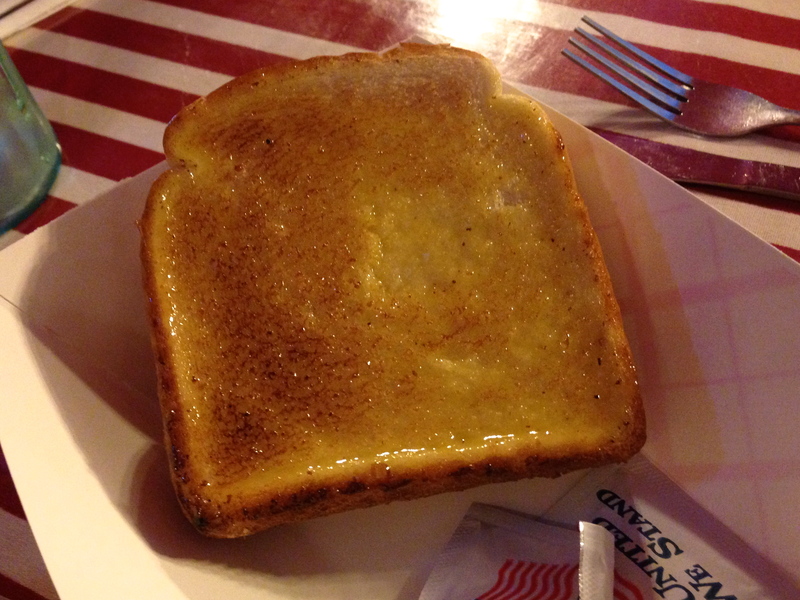 And now a shout-out to the Texas toast, which looks lonely in its own little basket. As you have seen, there is no room on the plate. Only in Texas could they come up with an appetizing name for a large hunk of white bread that’s slathered in butter and garlic. I did eat a couple of guilt-laden bites, though. 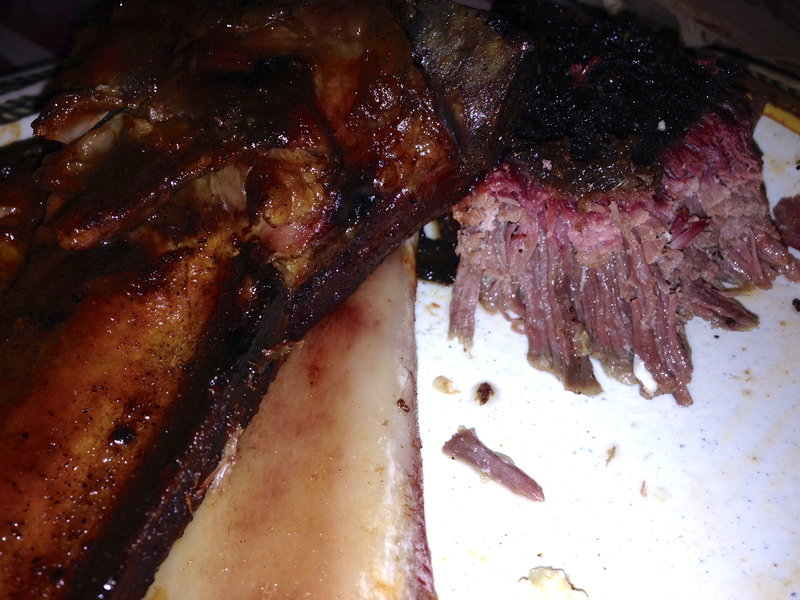 We take a shot of the smoke ring on the ribs so you can see how nicely these are cooked. The two of us cannot eat all of this and we both get lunch out of it the next day. Our solo offspring joins us tonight and he orders the baby back ribs. They have a good, smoky flavor and the meat falls off the bone. He likes the baked beans as they have large chunks of pork in them. The recent college graduate can’t finish his plate either and the leftovers come home for a late-night snack. About half way through the meal, Michelle stops by to remind us to leave room for some house-made cheesecake. Good customers that we are, we do as she says. There are four flavors. We choose the Oreo. It’s a good choice. 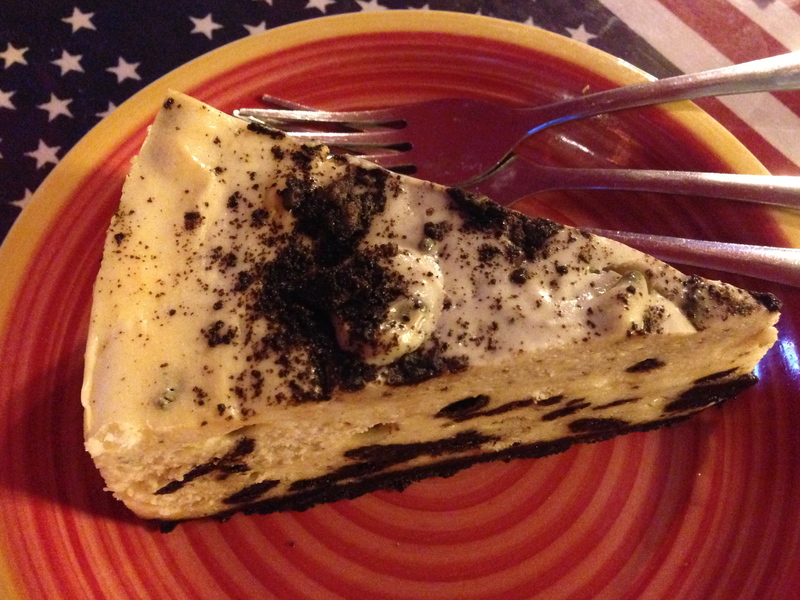 It’s much lighter than cheesecake usually is and the chocolate crust is a nice touch. We are glad that the remaining room in our stomachs is taken by such a nice dessert. 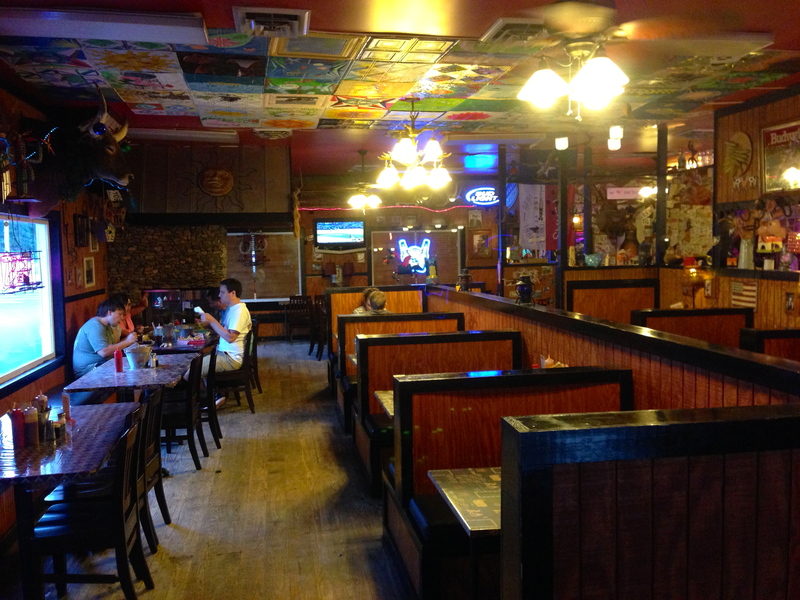 The bottom line on Rib Ranch: Texas-sized taste and portions and some of the best BBQ we have had in a long time. Go here when you are hungry, because you will be full when you leave. 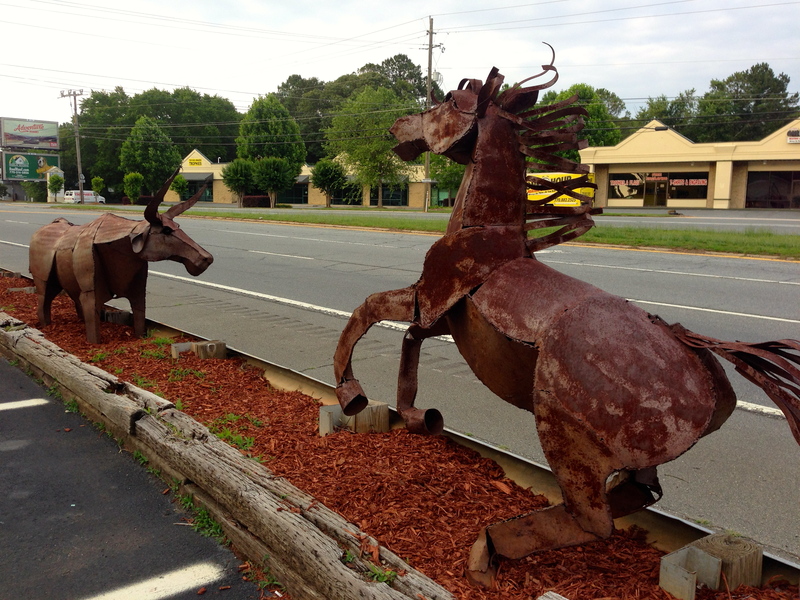 BBQ lovers will really enjoy this gem off of Canton Highway.